Step into the airsoft battlefield without overstepping your budget with the second generation of Lancer Tactical airsoft rifles. 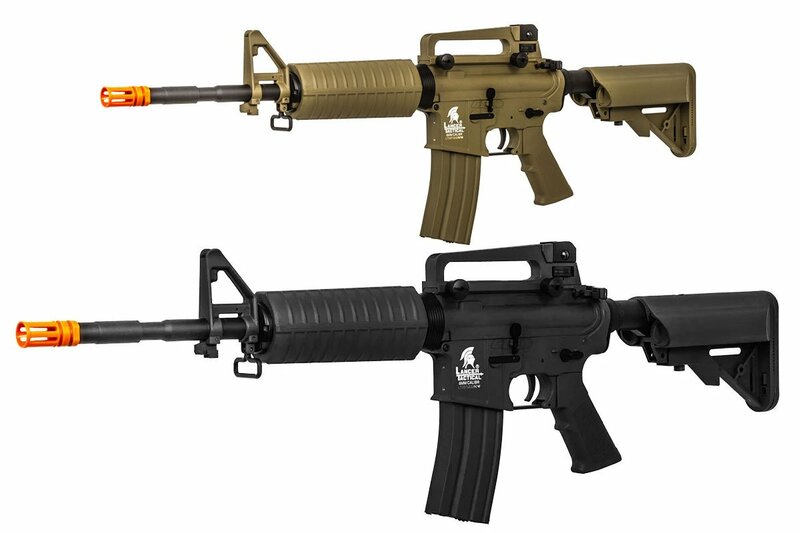 The Lancer Tactical Generation 2 M4A1 Carbine AEG from Airsoft GI features a newly upgraded, nylon-reinforced polymer body that combines toughness and durability with light weight. That means you can be extremely maneuverable, letting you stay in the fight longer so you and your teammates can prevail. Besides giving you the mobility to quickly take cover, this carbine also offers you great capabilities for attacking. It features an adjustable front and rear sight, so you can dial in and zero your shots, and a detachable carry handle, so you can attach your favorite optic. One sling loop in the front and a QD point at the rear of the rifle allows for attachment of a sling to make the rifle comfortable to carry. Choose from two colors for this gun: tan or black. Inside, the second generation of these Lancer Tactical guns comes with standard Version 2 gearboxes. That means this gun can grow with the game and with you, because upgrades and modifications will be easy to come by. These upgraded gearboxes come out swinging. They boast an upgraded motor, 8mm ball bearings to ensure the gears spin more efficiently with less friction, a quick-change spring system and low-resistance wiring to ensure electrical flow from your battery to your rifle. The rifle also features a 6.03mm tight-bore barrel and a rotary dial hop-up unit, delivering more precise, accurate shots at range. This model shoots approximately 375 to 395 feet per second out of the box, perfect for long-range engagements. Our price would be exceptional enough for this great gun, which has the feel of much more expensive weapons. But you get even more for your hard-earned cash here at AirsoftGI.com. Along with the gun, this package deal includes a high-capacity magazine, a 9.6V battery and a smart charger, giving you just about everything you need to get out there and play. 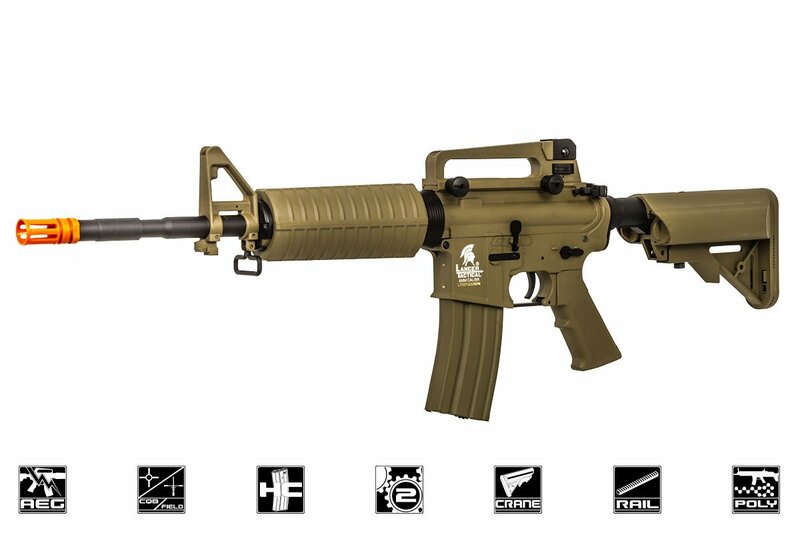 Pick one up and enter the fight on your own terms with this impressive second generation Lancer Tactical M4 carbine. I got it from Mega, but GI is way better. I couldn't get mega to answer my emails. I asked GI to help me get battery and charger and they answered right away. Gun works great out of the box, good job Lancer Tactical. I am a fan of their products for life. It shoots straight and far, I cant believe it out shot my friends combat machine. I am planning to save up and get another gun, any suggestions? great price, but still feel like an expensive gun. It makes me want to play airsoft every weekend. I got this gun In February, I did extensive research and found this gun to be the best products for the price of $120. I do not regret buying this, and would certainly buy it again. This airsoft gun is very accurate and easy to shoot. This gun is very good for beginners. It shoots very reliable and has not yet gotten jammed, with about 20,000 rounds through it. what is the length of the outter barrel? What are some other brand of magazines that'll work with this rifle? For example would a Elite Force or a G&G Mid-Cap magazine work? Any standard M4 style magazine should work. I would recommend Elite Force M4/M16 140 rd. AEG Mid Capacity Magazine - 10 Pack (Black) . nowhere to plug the battery into the gun?! We cannot find a receptacle on the gun to plug the battery into. Please advise! !